The holidays have always been a time to give to others. Why not amplify this spirit by not only giving to friends or family, but to communities at large? 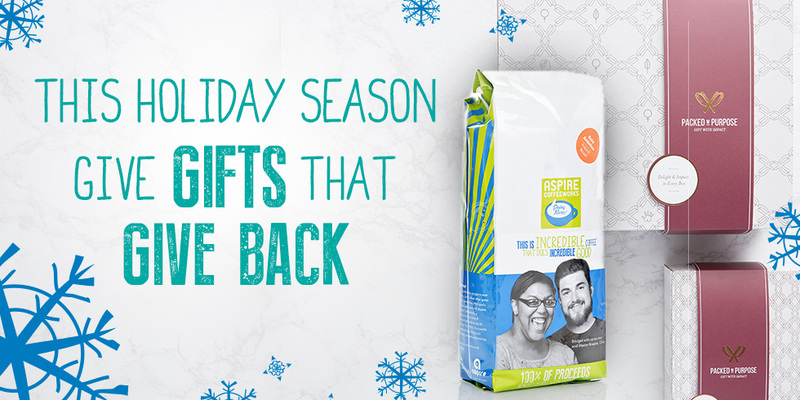 Aspire CoffeeWorks is excited to partner once again with Packed with Purpose, a Chicago-based corporate gifting company with a social mission. Together, we have created two unique, specially-curated holiday gift boxes featuring Aspire CoffeeWorks’ coffee to give an outstanding gift that does more – by doing good! Every item in every Packed with Purpose box is sourced from high-quality, socially-conscious purveyors to impress recipients and generate a meaningful social impact. Each gift is packaged in a signature Packed with Purpose-designed box made of recycled materials, which includes the story behind each product and the positive impact they have on their communities. We live in a time when “cause-sumption” is trending and brand loyalty is difficult to build and maintain. Giving a gift that gives back is a unique way to showcase your company as a positive changemaker in the community. Each box reinforces your commitment to doing good, all while giving a a stellar, standout gift! Innovate your gifting this holiday season by reinforcing a mission-minded message to your constituents, clients, stakeholders, and employees. We’ve created two specialty box options: a $45 “Energize with Purpose” box, and a $65 “Energize with Purpose Deluxe“. For a full list of our holiday gift options, visit our shopping page here.